Collett E. “C.E.” Woolman, Delta’s principal founder and first Chief Executive Officer, had a different vision for an airline when Delta began offering passenger service in 1929. Woolman was committed to the idea that customer-focused employees directly contribute to the success of the organization—a tenet that continues today. Woolman’s route to aviation titan came through agriculture. His interest in aviation began in 1909 after he attended the world’s first aviation meet in Rheims, France. Woolman soon graduated from the University of Illinois with a Bachelor of Arts in agricultural engineering and become an Agricultural Extension Agent at Louisiana State University. Woolman helped the U.S. Department of Agriculture fight the cotton-destroying boll weevil. Woolman and a team of entomologists used Army-loaned aircraft and pilots to conduct dusting experiments in an effort to eradicate the pest, which was devastating Southern farms. The efforts were noticed by aircraft manufacturer Huff-Daland Aero Corporation, whose leaders decided to form a crop dusting division, called Huff Daland Dusters. Woolman was named as the leader of the group. In 1925, the group moved to Monroe, La., and grew its fleet to 18 aircraft. As the need for crop dusting decreased in the winter, Woolman began operations in Mexico, and in 1927 expanded to Peru where he began passenger air service. Two years later, Huff-Daland Aero Corporation was in financial trouble and was looking to sell Huff Daland Dusters to generate revenue. Believing in the potential of the group, Woolman found four local businessmen – C.H. McHenry, Travis Oliver, M.S. Biedenharn and D.Y. Smith – who were interested in buying the division and shortly after Delta Air Service – named for its Mississippi River delta environs - was born. Woolman was named vice president and general manager and then to the board of directors. In 1929, Woolman's dream of expansion led to the purchase of three five-passenger, 90 mile-per-hour Travel Air monoplanes, and on June 17, 1929, Delta operated its first passenger flight from Dallas to Jackson, Miss., with stops at Shreveport, La., and Monroe. 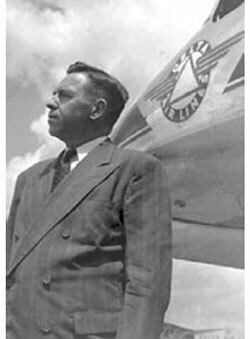 Passenger service took hold throughout the country in the 1930s and 1940s and in 1945, Woolman was named Delta Air Lines president and general manager. The carrier had by that time moved to from rural Monroe to up-and-coming Atlanta. "It begins with the first contact with our passengers, no matter where this is—reservations, porter, ticket agent or wherever. Make the customer feel special." One of Woolman’s credos was: "Any individual or business that is completely honest in all its dealings is likely to succeed." His values still resonate with Delta people today through the Rules of the Road and The Way We Fly. And another of Woolman’s sayings - "Let's put ourselves on the other side of the ticket counter. We have a responsibility over and above the price of a ticket" – is still quoted in current Richard’s weekly "Right from Richard" messages.